If you recall, Pok Pok Phat Thai debuted at the end of 2014 to significant fanfare. That, however, was just a Pok tease. After a series of delays, the proper restaurant finally bowed on October 28th following a week of preview dinners, taking up residence inside Chinatown's Mandarin Plaza. 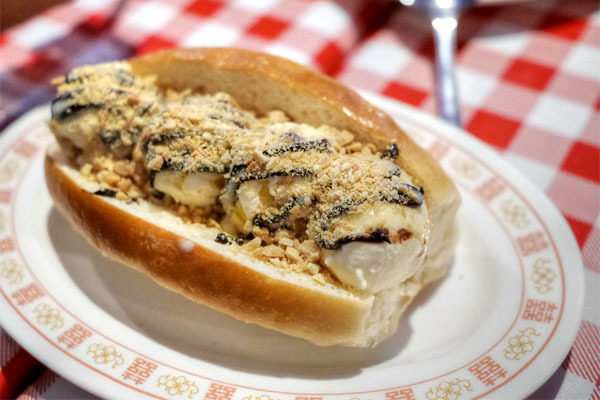 Pok Pok commands a capacious space that was once home to Batavia Cafe and Fu Ling. The restaurant seats 200 diners across two floors, and there's even ample patio seating out back. 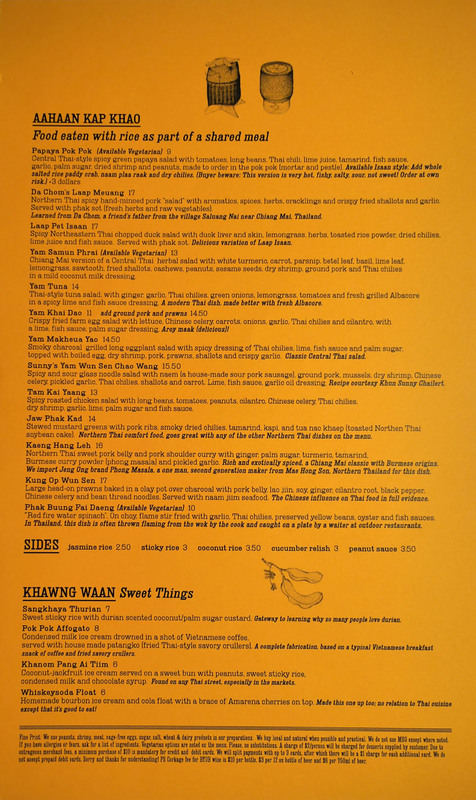 The menu is in the same vein as that at the original restaurant, replete with its signature verbosity. 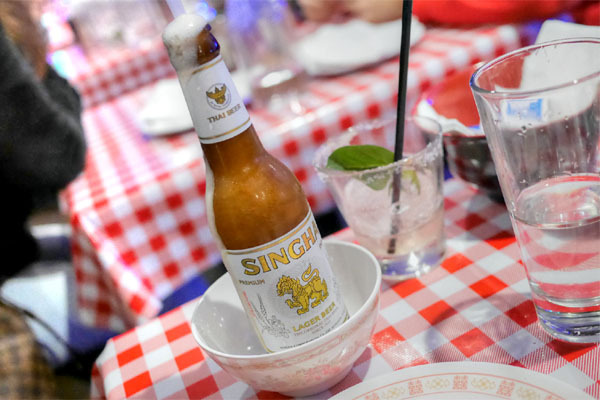 Think food mostly from the North and Northeast (Isan) of Thailand (with an occasional dalliance southward and east), meant for sharing, for eating with sticky rice, and for pairing with booze. 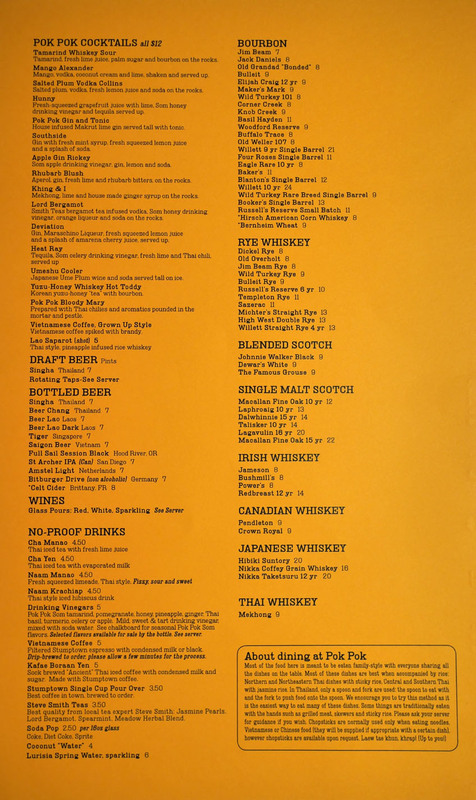 And speaking of drinks, you'll find theme-appropriate cocktails, lightweight beers, a couple house wines, and a surprisingly complete selection of whiskey. Corkage is $10 for wine, $3 for 12oz bottles of beer, and $6 for 750mL bottles of beer. I have to applaud Ricker for offering such reasonable fees, for making a distinction between beer and wine, and for going the extra mile and differentiating between different sizes of beers. I wish more restaurants would take up this approach. Click for larger versions. 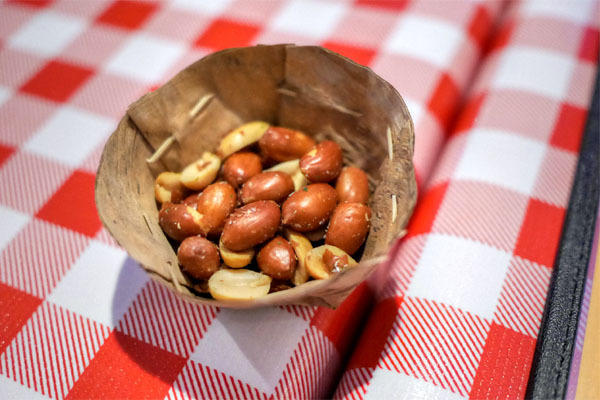 Amuse bouche duties were handled by a complementary serving of Thua Thawt Samun Phrai, a delightfully nutty, spicy, almost astringent preparation of deep fried red peanuts with dried chilies, lime leaf, garlic, and sea salt. Rhubarb Blush [$12.00] | Aperol, gin, fresh lime and rhubarb bitters, on the rocks. 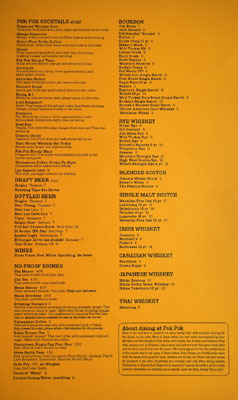 We took advantage of the beer corkage policy, but also sampled a few of the cocktails. The first was nice enough, light and a bit sweet, a bit tart, but rather thin. I was expecting more of the advertised rhubarb. Neua Khwai Sawan [$8.00] | Deep-fried marinated dried buffalo with coriander seed and deep fried lime leaves. Isaan-Thai style jerky. 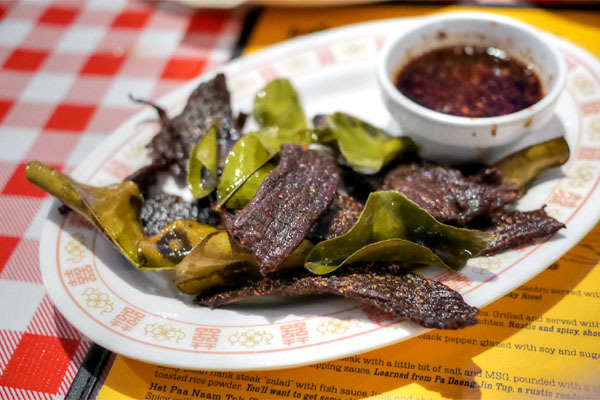 Buffalo jerky was satisfying to the bite, herby and meaty to the taste, and perked up by that pungent dipping sauce on the side. 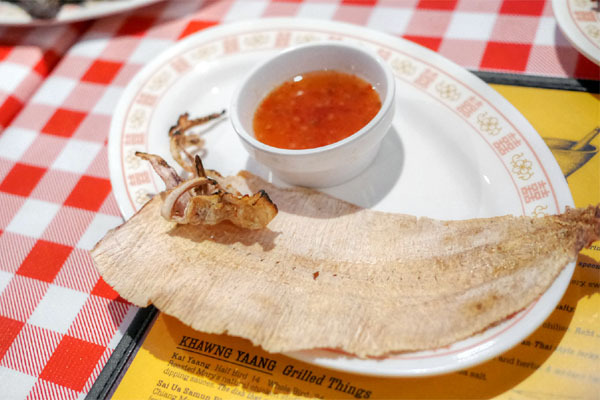 Plaa Meuk Ping [$7.00] | Char grilled dried Thai cuttlefish, run through the squid press to tenderize. The most iconic Thai drinking snack. Cuttlefish showed off deep, penetrating umami notes that reminded me of the Chinese-style youyu si snacks that I used to have as a child. The included condiment, meanwhile, imparted a sweet 'n' sour brightness to the dish. 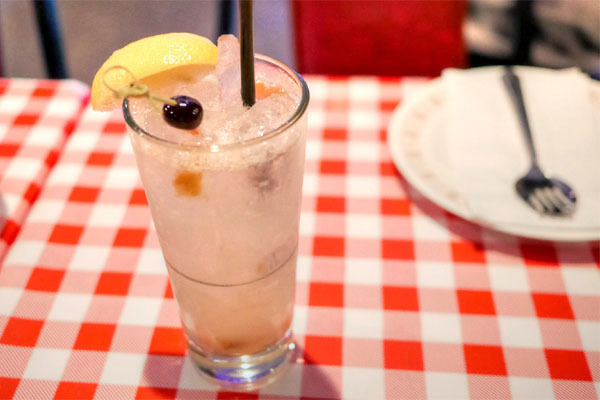 Salted Plum Vodka Collins [$12.00] | Salted plum, vodka, fresh lemon juice and soda on the rocks. A playful take on a Collins cocktail combined a base of tart lime/vodka with the sweet-salty-sour, long-lingering qualities of salted plum. 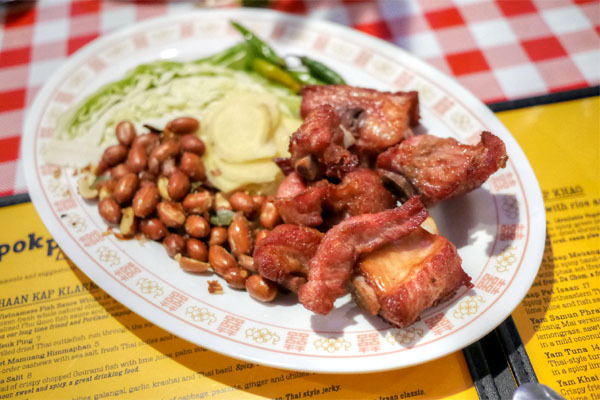 Naem Sii Khrong Muu Thawt [$12.00] | Sour cured pork riblets deep-fried and served with a side of cabbage, peanuts, ginger and chilies. Roht Jat Maak Khrap! Riblets were fun, conveying a pleasant pucker alongside their requisite meatiness. Very well tempered by the included cabbage and ginger, and I didn't mind more of those peanuts either. 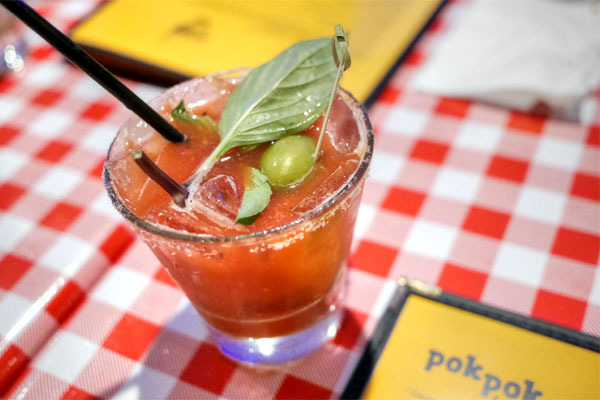 Pok Pok Bloody Mary [$12.00] | Prepared with Thai chilies and aromatics pounded in the mortar and pestle. 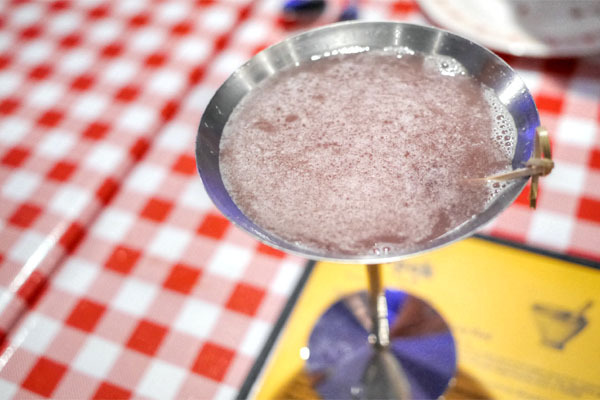 The restaurant's version of the Bloody Mary was a kick in the pants, displaying boatloads of spicy, savory, deeply aromatic notes over a base of semi-sweet tomato. 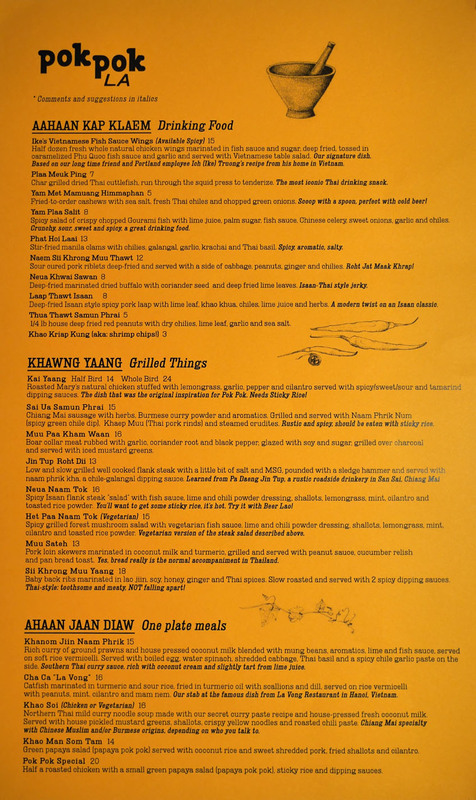 Jin Tup Roht Dii [$13.00] | Low and slow grilled well cooked flank steak with a little bit of salt and MSG, pounded with a sledge hammer and served with naam phrik kha, a chile-galangal dipping sauce. Learned from Pa Daeng Jin Tup, a rustic roadside drinkery in San Sai, Chiang Mai. Flank steak was surprisingly tender, its mild taste augmented by a dab of the zippy nam phrik on the side. Not much to look at, but strangely addicting. 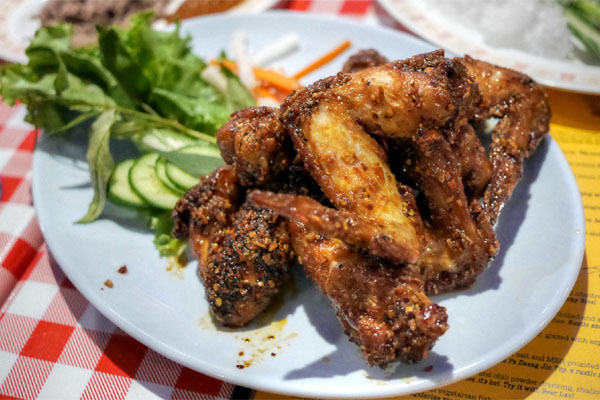 Ike's Vietnamese Fish Sauce Wings (Spicy) [$15.00] | Half dozen fresh whole natural chicken wings marinated in fish sauce and sugar, deep fried, tossed in caramelized Phu Quoc fish sauce and garlic and served with Vietnamese table salad. Our signature dish. 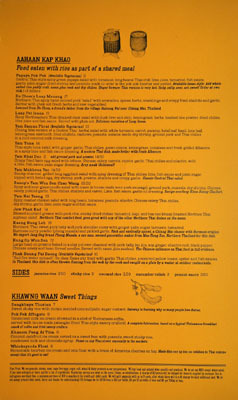 Based on our long time friend and Portland employee Ich (Ike) Truong's recipe from his home in Vietnam. Pok Pok's signature wings were a crowd pleaser as always. Great crunchiness to 'em, along with a tasty combination of sweet 'n' spicy flavors that worked well with the bird. I'd actually love to see these in drumstick form--easier eating that way. 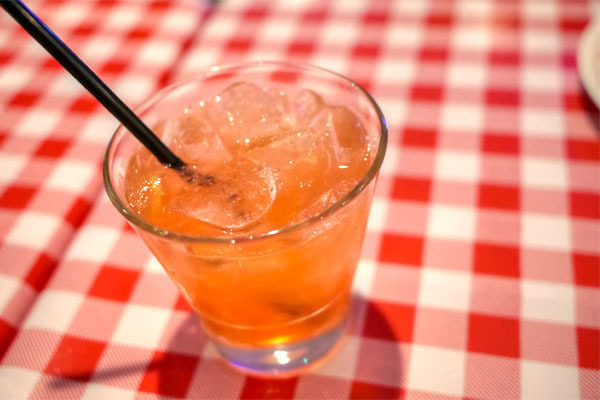 Deviation [$12.00] | Gin, Maraschino Liqueur, fresh squeezed lemon juice and a splash of amarena cherry juice. served up. Our final cocktail managed to be my favorite of the bunch. Superb interplay of sweet, bitter, and tart on this one, finished by a lingering fruitiness. Muu Paa Kham Waan [$16.00] | Boar collar meat rubbed with garlic, coriander root and black pepper, glazed with soy and sugar, grilled over charcoal and served with iced mustard greens. 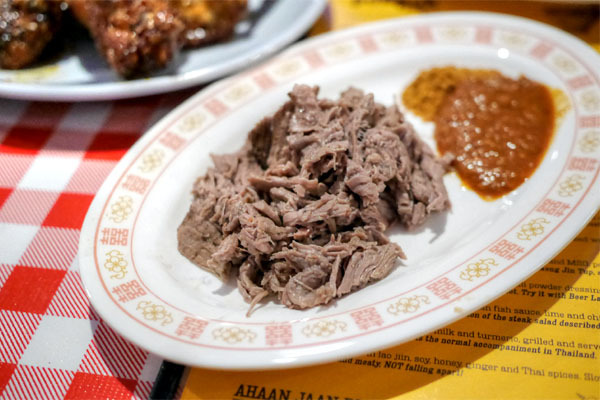 Boar was gratifying with its blend of sour-spicy-meaty, but the crux of the dish was the use of semi-frozen mustard greens, which provided a cool, countering crunch to offset the potency of the collar. 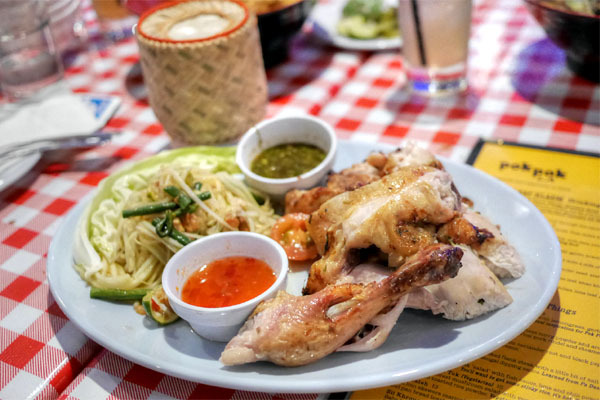 Pok Pok Special [$20.00] | Half a roasted chicken with a small green papaya salad (papaya pok pok), sticky rice and dipping sauces. Pok Pok actually started in 2005 as a take-out stall selling kai yang and som tam, so this was sort of an homage to the restaurant's humble roots. It was a solid roast bird, with classic flavors joined by more Isan-inflected notes, and the papaya salad was just what you'd expect. However, I was slightly concerned that a couple parts of the chicken seemed underdone (though they were easily avoided). Here we see the Bia Wun [$8], the oft-mentioned "jelly beer" that's created with a rapid-cooling device. It's basically a beer slush: utterly cool, refreshing, and somehow sweeter tasting than usual. 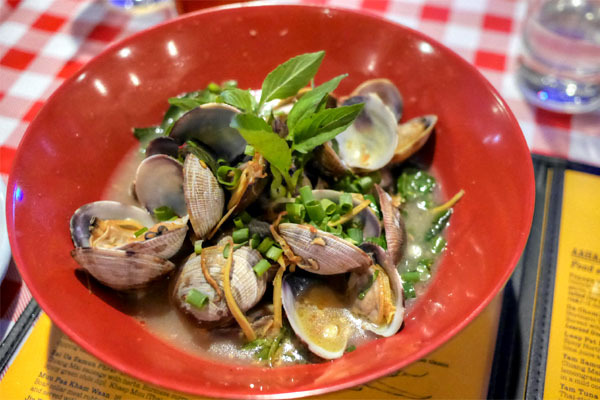 Phat Hoi Laai [$13.00] | Stir-fried manila clams with chilies, galangal, garlic, krachai and Thai basil. Spicy, aromatic, salty. The clams were a surprise favorite of mine. They were spot on texturally, and their brine worked beautifully with the massive amounts of spice and herb in the dish. Loved supping up all the remaining broth here, too. Beer time. 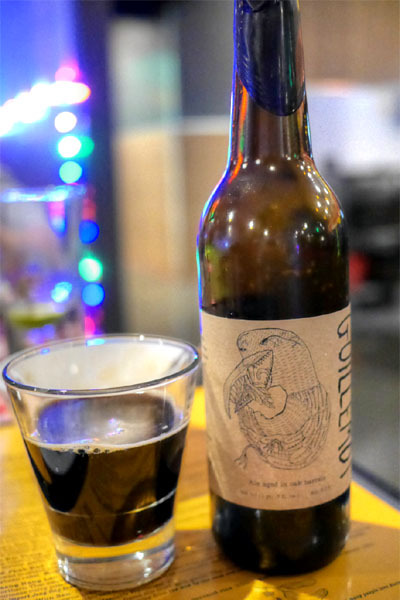 First was the 2015 Tired Hands Guillemot Nebula, a dark saison aged in oak barrels. Think tangy dark fruit on the nose, while the palate was all about malty, almost chocolate notes commingled with tart, barnyard nuances. 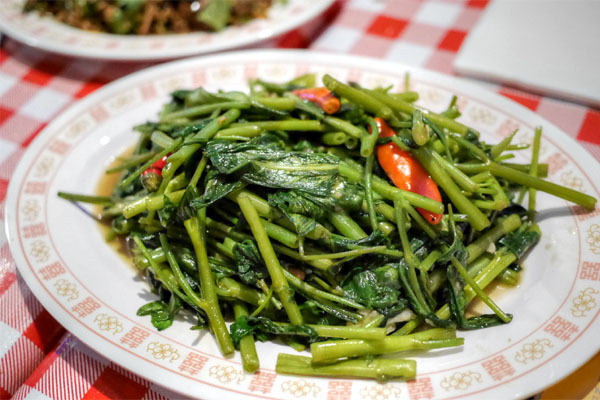 Phak Buung Fai Daeng [$10.00] | "Red fire water spinach". On choy, flame stir fried with garlic, Thai chilies, preserved yellow beans, oyster and fish sauces. In Thailand, this dish is often thrown flaming from the wok by the cook and caught on a plate by a waiter at outdoor restaurants. Another highlight was the water spinach, probably one of the strongest preparations of the veggie that I've had. Excellent crunchiness, with its garlicky flavors meshing perfectly with the rich umami notes from the oyster and fish sauces. 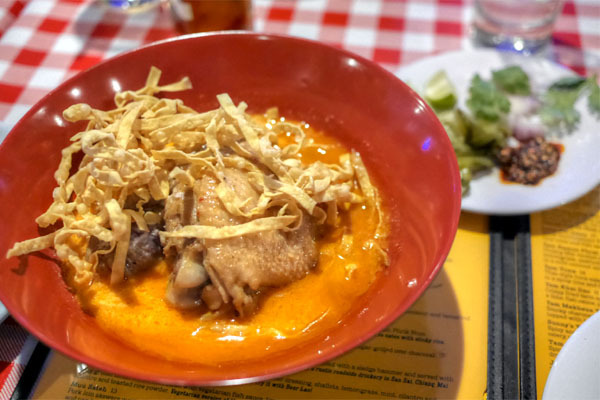 Khao Soi (Chicken) [$16.00] | Northern Thai mild curry noodle soup made with our secret curry paste recipe and house-pressed fresh coconut milk. Served with house pickled mustard greens, shallots, crispy yellow noodles and roasted chili paste. Chiang Mai specialty with Chinese Muslim and/or Burmese origins, depending on who you talk to. Khao soi seems to be the Northern Thai dish of the moment. 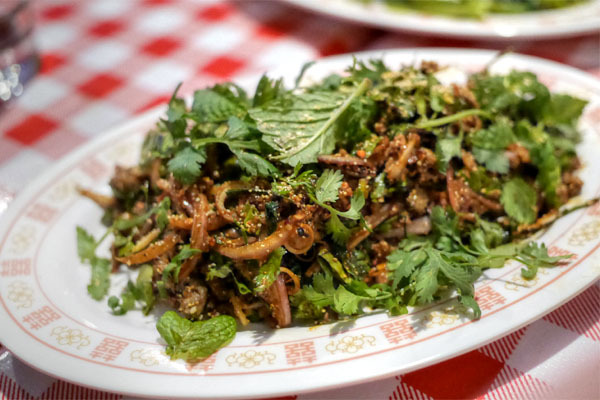 Pok Pok's was comparatively mild, with a base of sweet, coconut-y flavors tarted up by the wonderfully zesty pickles and chili paste while crispy noodles imparted textural contrast. The actual chicken, though, was somewhat tougher than I'd prefer. 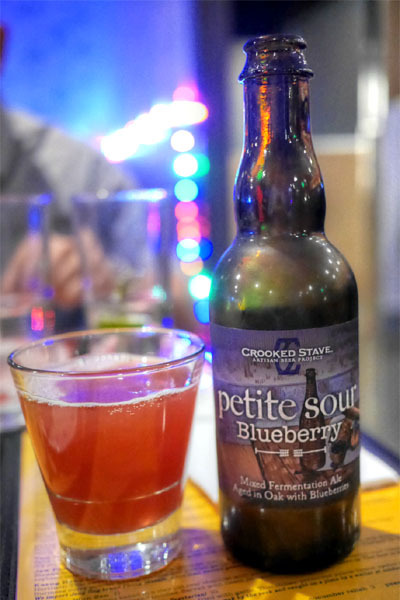 The 2015 Crooked Stave Blueberry Petite Sour was a wild ale aged in oak with blueberries, my favorite of the three versions of the beer I've tried. I found it gorgeously jammy and tart to the smell; the taste followed, with a bit more oak presence rounding things out. Very tasty. Laap Pet Isaan [$17.00] | Spicy Northeastern Thai chopped duck salad with duck liver and skin, lemongrass, herbs, toasted rice powder, dried chilies, lime juice and fish sauce. Served with phak sot. Delicious variation of Laap Isaan. Our final savory, the larb definitely delivered, its rich, duck-y flavors joined by a delightful pungency and a piercing, permeating heat that made the dish the spiciest of the night. Some interesting textures from the rice powder, too. 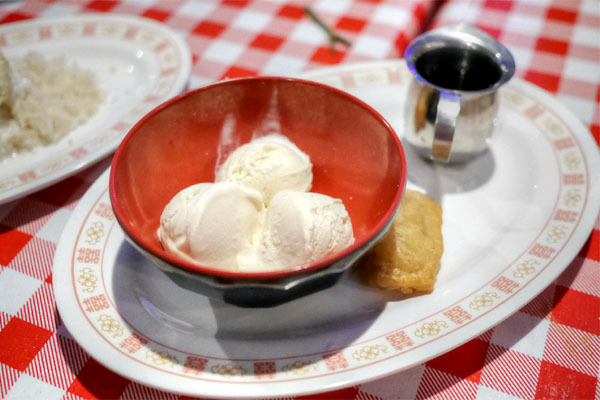 Pok Pok Affogato [$8.00] | Condensed milk ice cream drowned in a shot of Vietnamese coffee, served with house made patangko (fired Thai-style savory crullers). A complete fabrication, based on a typical Vietnamese breakfast snack of coffee and fried savory crullers. Time for dessert. This take on affogato hit the mark, giving up loads of sweet coffee that made for good dipping with the savory patangko. 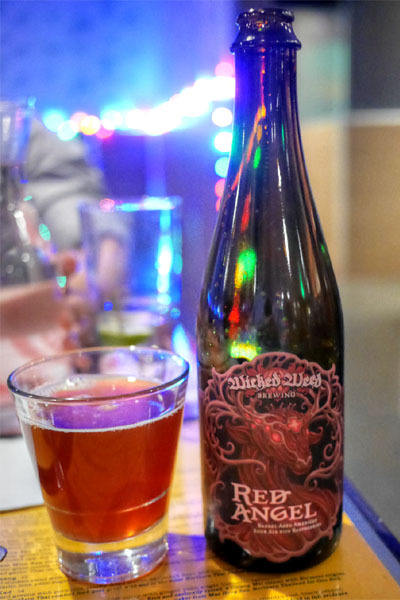 Our second sour was the 2015 Wicked Weed Red Angel, aged nine months in oak red wine barrels with 1.5 pounds of raspberries per gallon, then aged another two months in stainless steel with another pound per gallon added. Again, very jammy on the nose, with rich raspberry aromas abound. The taste brought more tart berry, joined by a palpable backbone of must and earth. 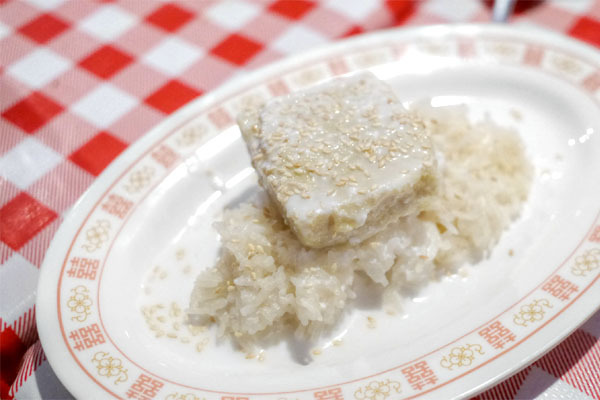 Sangkhaya Thurian [$7.00] | Sweet sticky rice with durian scented coconut/palm sugar custard. Gateway to learning why so many people love durian. The menu described this as a "gateway" to durian, an apt description. The funkiness of the fruit was there, though in moderate amounts, commingled with tropical coconut flavors and a superb nuttiness from the sesame seeds. Khanom Pang Ai Tiim [$6.00] | Coconut-jackfruit ice cream served on a sweet bun with peanuts, sweet sticky rice, condensed milk and chocolate syrup. Found on any Thai street, especially in the markets. We closed with an ice cream sandwich, a damn good one at that. Fruity, coconuty, sugary, nutty, chocolatey, and with a bit of char character to boot. This is one you probably want to get. 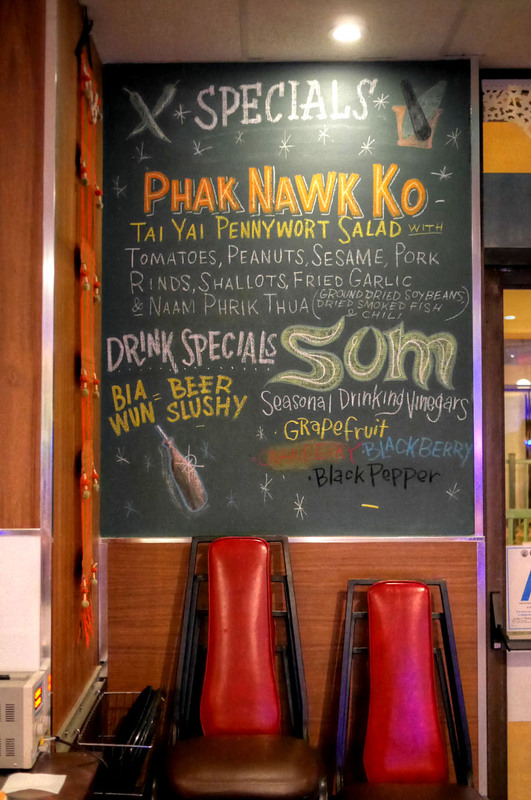 If you're a fan of the original Pok Pok up in Portland, you should be well-served in Chinatown. 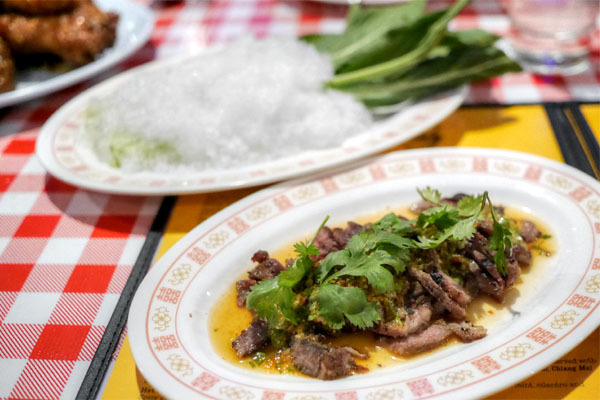 Ricker's take on Thai cookery is probably different than what most Angelenos are accustomed to, but makes for one of the most significant debuts in the area in a long while. 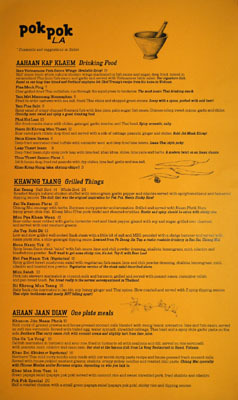 A worthy addition to Los Angeles' Thai cuisine conversation.